What prompts a well-renowned scientist in molecular biology to write memoirs about a part of his life? In the case of Gunther Stent, it was not to reflect on his career as a scientist, but to come to an understanding of his own soul. In his seventies, he had come to see that he had been, throughout his life, an emotional sleepwalker, especially as regards women and, in addition, that he had been troubled by Jewish self-hatred. His story may have more to do with St. Augustine's Confessions than with a scientist's memoirs. Stent provides insight into the power of political correctness, and the ability of a government to establish a perverse vision of reality. For readers interested in bioethics, Stent's memoirs help to explain how Germany could have been the first country to enact an all-encompassing protection for human research subjects while it was also the country that produced the medical experiments of the Nazis and the greatest perversion of medical morality in history. Stent is a person of intelligence and subtlety, an accomplished writer, a deep and wise man, and a loyal friend. His narrative is centered emotionally on a youth spent in Berlin in the Nazi period. As a boy of fourteen he was an eyewitness of the horrors of the Kristallnacht pogrom.On New Year's Eve 1938 he escaped from Germany across the "green frontier." He came to America in his teens, only to return to Berlin at the end of World War II as a scientific consultant for the U.S. Military. On his return to the States, Stent participated in the exciting early scientific breakthroughs of molecular biology that transformed the twentieth-century life sciences. 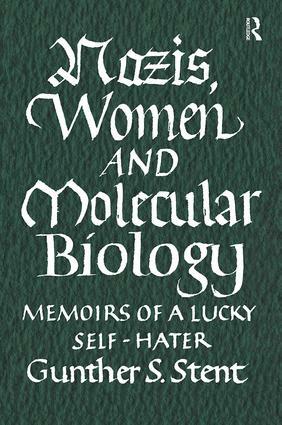 His Nazis, Women and Molecular Biology is a piercing self-examination, and as its review in Science Newsletter says, "an act of self-exposure, abnegation, contrition, and expiation." It will be of keen interest to those who have inhabited Stent's worlds or shared his experiences, as well as those who wish to learn more about them. Gunther S. Stent is professor emeritus of neurobiology at the University of California, Berkeley. He is the author of such classic texts as Molecular Biology of Bacterial Viruses and Molecular Genetics, as well as philosophical books, such as The Coming of the Golden Age, Paradoxes of Progress, and, most recently (2002), Paradoxes of Free Will.